I mean, hey, this thing is perfect, right? It has everything I could want — his name, that he was the first-born child, that his mother lived at 4839 Bishop, doesn’t it? It says that his father was Herman Franz Schreiner, a safe mechanic, 41 years of age, German American, and born in Gera,2 Reuss Jüngere Linie, Germany,3 and that his 37-year-old mother was Augusta Paula Schreiner, born Augusta Paula Graumüller in Köstritz,4 Reuss, Germany. It was signed by the doctor who delivered the kid, and he should know, no? This is absolute total proof of all KINDS of stuff! Like everybody else, I have to force myself to remember: “Sources give us information from which we select evidence for analysis. A sound conclusion may be considered proof.”6 This birth certificate is a source. It’s a great source. It may be the best source I can ever find. It contains first-hand information (from the doctor) about the birth of a male infant at a particular place at a particular time. In the absence of any reason to doubt the doctor, his direct evidence about that birth supports a conclusion that there really was a baby boy born then and there. Considering the filing date, I’m not sure you can be one-hundred percent sure of the exact date of birth either. Plus, you have to add the fact that the German accent was involved. It looks like the doctor may have been of German descent, which would help. I would follow up by looking at where he and his parents were born to try to get an idea of how far removed from the language he was. This was a lot of information for the child of immigrants to have on his certificate compared to my Norwegian ancestors in Texas. No child name, no birth date, and the parent’s names a jumbled mess. The only evidence I have as to how my grandmother’s name (the un-Americanized spelling of my own name) was spelled is her signature on her last driver’s license. Excellent post. Thanks, Rondina! Yes, this surely is a lot of information to have on a birth certificate that early. I was frankly stunned: I also have loads of Texas ancestors and even FINDING a birth record that early in Texas would be a surprise. I am very fortunate to have a lot of corroborating information but I still have a lot of work to do here. I’d take this one step further: no record (or the information it holds) ever *proves* anything. Don’t you love all the clues here which will lead you all over to find ever more documents – some of which may even be primary sources … leading you to come to wonderful new conclusions! Or – many more questions! Either way, so much fun! Congrats for finding this document. 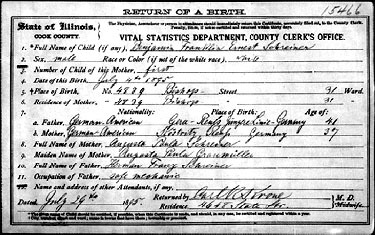 Celia, without a doubt, this is the most amazing birth certificate from this time period I’ve ever seen. Just finding ANY birth certificate from this time period is good. Finding one with this much detail? I was shocked. Nice job, Judy! You made Randy Seaver’s list again? I think that’s three or four weeks in a row. You’re on a roll! Thanks, Susan! I’m honored to be in the company of folks like you! Thanks for the kind words, Bill. I’m so glad you’re finding the info useful! My brother was my Dad’s POA and needed Dad’s 1906 birth certificate at some point. When it arrived I told my brother that I wanted a copy. It was full of great detail. This doctor had not provided “supplied” information. The delivering doctor was my Dad’s maternal grandfather who knew all of the information. But my Father was very surprised to discover he had spent his whole life celebrating his birthday on the wrong date. What a great story, Ed! Don’t forget that even a grandfather can be wrong in some details, though! Still, what a lovely find for you, your brother and your Dad (even if he HAD celebrated on the wrong day!). What, can’t you just click on the leaf? THAT comment made me laugh out loud… and then pull my hair out!